Which way? North to South or South to North? 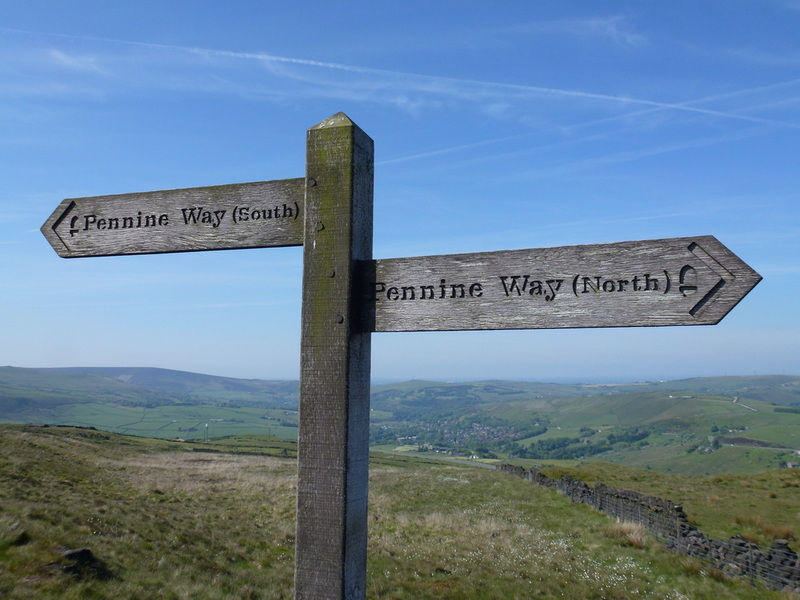 Most people walk the Pennine Way from South to North. This is mainly because the wind and rain will be at your back and also most guide books are written in this direction. Don't let that put you off though - people who have walked it the other way around do seem to enjoy it just as much. If we ever did the walk again we would consider reversing our route and giving it a go. We started planning our trip about a year before our start date. There is obviously lots to think about and we have detailed some of our thoughts and actions below. It was never going to be easy trying to sort out an itinerary over 21 days - what made it even more difficult was that we had a dog. We always try to stay in B&Bs that are actually on or close to the route but in Dufton and Bowes this simply was not possible. Dufton had no dog friendly B&B's and Bowes had no accommodation although the pub in the village (The Ancient Unicorn) is now open for business again (from September 2015). Therefore for Dufton we stayed in nearby Appleby and arranged with the owner to pick us up and drop off us for a nominal charge. In Bowes we booked a taxi in advance to take us to Barnard Castle and back which was the nearest accommodation to the route. The moral of the story is not to be put off if you cannot find accommodation on the route - we have found most B&B owners are fairly flexible people. As for booking B&B's - it is never too early to book. All will more than likely pencil you in and send you e-mail confirmation and ask you to contact them nearer the time in order to arrange a deposit. We checked our bookings at 6 months before departure and also about 2 weeks before starting the walk. We had no real problems with the standard of B&B - some are better than others but on the whole we were very pleased with our lot. One thing we would recommend is making sure each B&B owner sends you e-mail confirmation that they have received your deposit. ​We used Brigantes to transfer our bags and we cannot speak highly enough of their service. They are clearly well run and flexible - we had absolutely no issues at all with our baggage - it was always at our accommodation well in advance of our arrival. When our plans changed at Alston at very short notice all it took was a quick call to Annette at Brigantes and our bags were brought back - yes there was an added cost for this but the service was prompt and quick. We had 3 bags transported by Brigantes. Two bags contained our spare walking clothing, stuff to wear in the evening, toiletries and spare food to eat during the day. Fudge had his own smaller bag which contained his bed, 3 weeks worth of his food plus his other bits and bobs (towels, spare harness, leads etc). 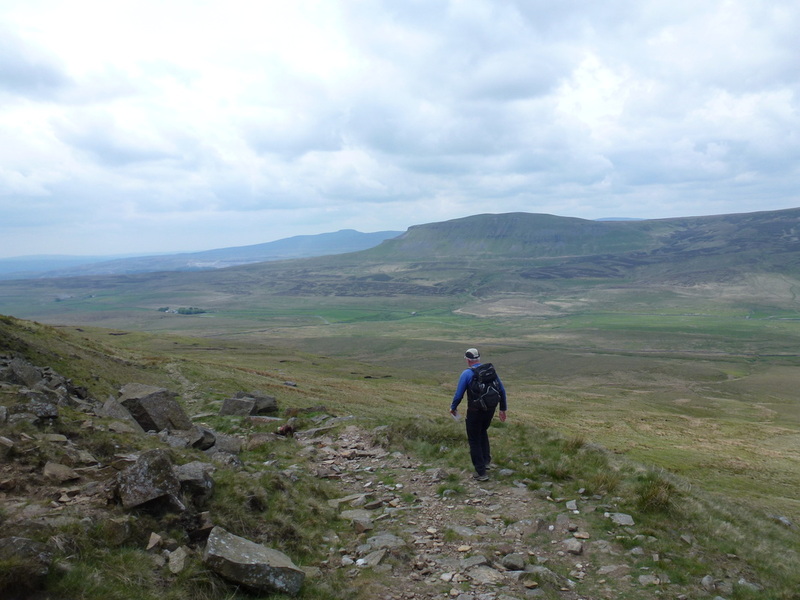 ​Whilst we took all the relevant mapping (OS Maps - OL1, 2, 16, 19, 21, 30, 31, 42, 43) and two compasses we only used them once when we took a bearing coming down off Cross Fell on Day 14. We pre loaded our 1:25 Satmap Active 10 GPS card with all the routes prior to starting the walk and whilst we referred to the GPS a few times, the waymarking is so good on the Pennine Way that providing the visibility is clear there is very little chance to stray off route. 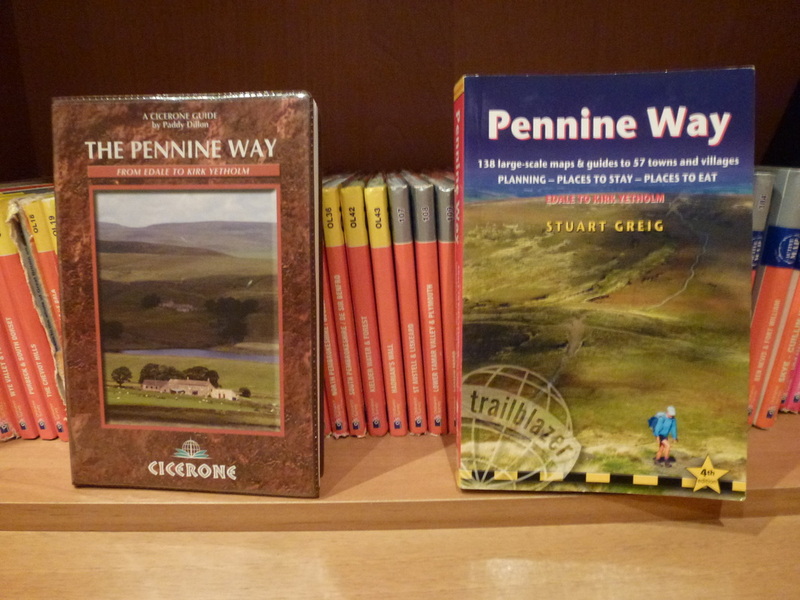 On a day to day basis and for route research we used two guide books - the Cicerone (link here) and the Trailblazer (link here). We cut the maps out of the Trailblazer, laminated them (in case they got wet!) 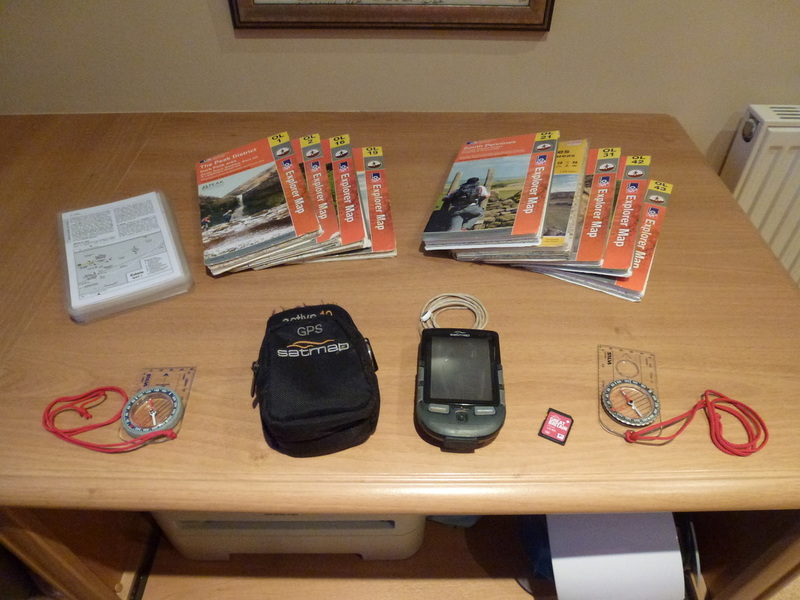 and used them to navigate by - with the option of referring to GPS and Map & Compass should the need arise. We cannot stress enough that on all walks a Map & Compass is a must and should be in your kit - more importantly you should know how to use them properly. What to take and what not to take - oh dear. We could go on and on about various bits of kit and bore you senseless but we will not - hopefully. 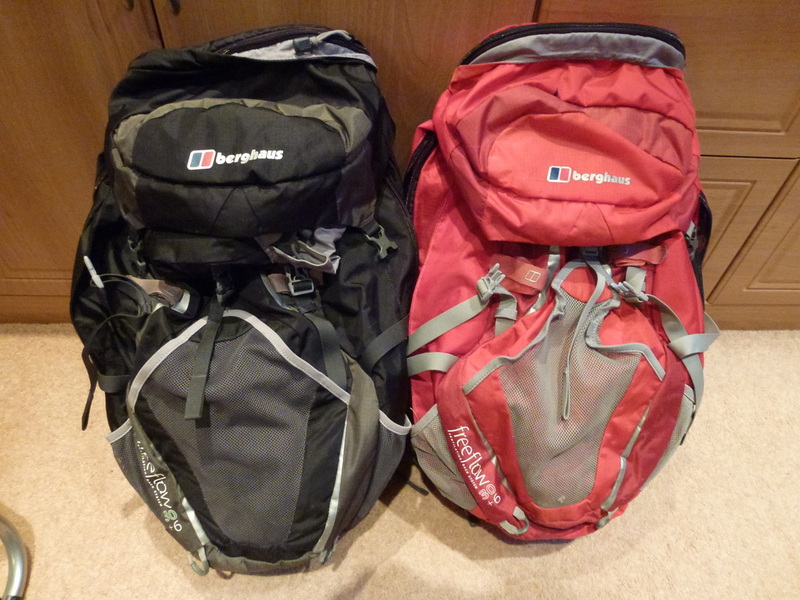 On a day to day basis our 2 x 30+6 litre Berghaus Rucksacks were big enough to carry our stuff - foul weather gear, food for the day, warm clothing and water. We made sure that we had plenty of water and also made a note as to where we could top our supplies up from. Starting out each day we would have one 2 Litre Platypus each plus a spare 700ml drinking bottle each which we would also use for Fudge although despite the excellent water on offer preferred to drink from the filthiest puddle or brook he could find. Boots - the most important piece of kit and of course they must be comfortable and well worn in (take spare laces too). Whilst we do not normally suffer from blisters, we had a daily foot routine before starting out. We taped up areas where we had blisters before and also rubbed in a very thin coat of vaseline on each foot. After showering at the end of the walk we rubbed our feet with a foot lotion - the end result was that neither of us had one blister in the entire 21 days. It is also an idea to put a foot spray in your rucksack and air your feet - before putting your socks back on use the foot spray. With regard to Fudge's paws, we were conscious that they would take a bit of a hammering therefore he had a daily paw regime too - paw wax in the morning and paw conditioner at night. This paid off as his paws were in great nick at the end. Walking the miles we did there is always the possibility of chafing in certain private areas! The easiest way to avoid having to smear a large amount of Lanacane on your bits each night is to wear a pair of lycra shorts each day. Result is - no chafing. As for washing our clothing, we took a bottle of hand wash for our smalls plus when we got the chance asked the B&B's if we could put a load on - some offer this facility and charge for it whilst some don't offer the facility, do it for you and don't charge. We kicked the backside out of Breakfast each day and ate our fill - after all we were paying for it! This meant that we would snack for lunch, stop at a tea shop if it was on the route and then have our evening meal. Our walking sustenance was stuff that would give us energy like Cereal Bars, Flapjacks, Chocolate, Nuts, Raisins, Fruit and Wine Gums. We did not leave Fudge out as his lunch was supplemented by Pemmican, a fish flavoured concentrate of fat & protein. There was only one day we took a packed lunch and that was the long Cross Fell day from Dufton to Alston. Ok so we had walked to Kirk Yetholm but how would we get back to our car which we had left in Torside? This was perhaps the most difficult part of the planning process and one we mulled over for a fair old while. After much discussion, e-mails and trawling of the Internet we came up with the best solution which was not necessarily the cheapest option but one which suited our circumstances - we did after all have 3 large bags, 2 rucksacks and 16kg of excitable Working Cocker Spaniel to carry! In the end we decided to catch a taxi from Kirk Yetholm to Edinburgh Airport then pick up a Hire Car. We would then drive to Torside where we would pick up our car and then drive in convoy to Manchester Airport to drop the car off. It would have been easier to have a car delivered to Kirk Yetholm and collected at Torside but no Hire Car company would do either. We managed to raise £1500 for Cocker & English Springer Spaniel Rescue and £500 for The Bracken Trust - many, many thanks to all those people who donated.